At his cane farm in the foothills of magnificent Mount Bartle Frere, Ray Vicarioli has learnt to make a sustainable living from the land, while dealing with Mother Nature’s propensity to dish out weather in lavish extremes. Ask the locals in the fertile country fringing the fast flowing Russell River, and they’ll tell you that when the clouds drop below the iconic ‘broken nose’ of Queensland’s tallest mountain that it’s about to rain. In a place where six metres of rain each year barely raises an eyebrow, it’s no surprise that drainage and soil hydrology can present great challenges, particularly on the more sloping paddocks approaching the mountainside. 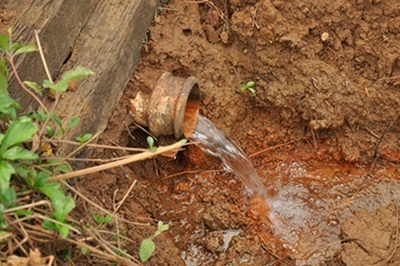 On the Vicarioli’s 116 hectare property, a range of techniques have been employed to deal with the one raw material for which there is often a drastic oversupply – water. Hilly paddocks have been contoured to reduce gradient and minimise water velocity. Sediment runoff has been limited by the application of silt traps. Sophisticated sub-surface drainage systems have also been constructed to minimise nutrient volatilisation, maximise storage of nutrient in soils and largely eliminate chemical runoff into drains. “If there’s any chemical in the water, it’s not going down into the creeks,” Mr Vicarioli said. “With the seepage pipes, we’ll dig a trench probably a bit over a metre, or one point two metres deep, put 100 mm of sand on the bottom, put in a drainage pipe and fill to the top with more sand. 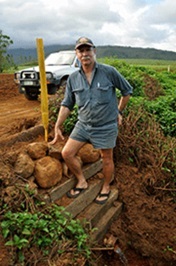 While Mr Vicarioli consistently tests for nutrients in the creeks, the evidence of healthy waterways is readily visible. Freshwater aquatic species that are sensitive to chemicals and require highly oxygenated water abound. “The place is very alive, full of life, the little creek that runs through here is full of sooty grunter, mountain (jungle) perch and rainbow fish, eels, prawns, you name it,’’ Mr Vicarioli said. Over the years, Ray, wife Rosemary, son Ryan and daughter Lucy have also embraced Landcare initiatives and have taken an active involvement in riverbank restoration. The other essential element of their philosophy is part of the creed for most growers in the wet tropics – make the most of every day, for tomorrow it will, almost surely, be raining. 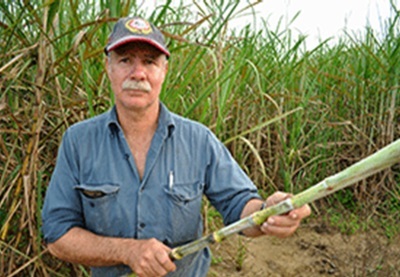 The Vicariolis have implemented sub-surface drainage systems to minimise nutrient volatilisation, maximise storage of nutrient in soils and largely eliminate chemical runoff into drains.